Originally printed in Issue 2 of the Occupied Dominion Post, publication by members of Occupy Wellington. 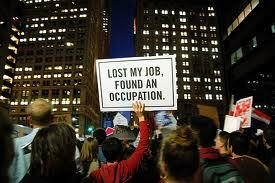 The Occupy Together movement draws in supporters from diverse backgrounds, with a range of employment situations. Many of the core organisers have other commitments, including work and study. Those with full-time work and families may not have the time or energy for urban camping – so they support the movement by donating food or resources, by organising workshops, by coming to General Assemblies. This movement is a broad church. More to the point, unemployment is a product of the system Occupy Together collectively challenges. Capitalism requires a reserve army of labour, a pool of unemployed workers to keep the labour market competitive. Under neoliberalism – the late stage of capitalism typified by cuts, privatisations and “free market” reform – structural unemployment is used to keep wages down. By demonising occupiers as unemployed layabouts, the DomPost conveniently misses the point: whether or employed or unemployed, we have valid grievances. Capitalists attack the class as a whole – declining real wages, structural unemployment and benefit cuts are all part of the same package. We must counter these attacks with solidarity, unity and inclusiveness. From factory floors, to desks, to WINZ offices – we are the 99%. It’s is not actually the paper of the occupation. It is a paper associated with and supported by the occupation. Will put a disclaimer to that extent on the next issue. campaign to end WFF, put interest back on student loans, change the RMA to allow faster subdivisions, remove the minimum wage and put a time limit on the dole. While you are at it remove any employee protection, ban strike action and reduce tax for the top pay bracket. Follow this simple plan and within 10 years you will have more committed supporters than you ever dreamed of. Corporate capitalism wants to jump off a cliff it is you who are holding it back. I know you don’t like the idea of not fighting the system and not standing up for workers rights but this is one reason why john key and his government is at 54% and few notice you people. It is because you stand up and push for improvements that small improvements are given. Never enough but just enough to suppress anger against the system. In New Zealand some of those who took money from the many are in court in America they get bonuses. America has less support for workers and more extreme social stratification. It is these things that have driven OWS in America. At the moment we do not have these extreme situations but that is why I say encourage corporate capitalism. Most of the debt that ratings agencies are concerned with is private debt. Debt can not be cut only paid down or inflated away this is the archillies heal of stability in New Zealand. If National are allowed to continue on their way and decrease workers right, force people into work and decrease taxes for the companies and top tier by things like interest on student loans and reducing WWF they will end up reducing wages while increasing costs. Profits will go up but only for the top, the ability for those below to service their mortgages will become harder. This will put further pressure on house prices and this is what is needed to trigger dissatisfaction within New Zealand. So that is why you should allow the zero sum capitalism to continue it is trying to commit suicide but you keep on pulling it back from the edge every time you win a small victory for workers and poor you delay the point at which change can occur.